‘Tis the season to start putting up your decorations. With tinsel, baubles, and enough glitter to make Tinkerbell jealous, your home may very well be kitted out in Christmas cheer already. Did you opt for a real or artificial tree this year? If you went for the real deal, you might be curious to know just how long a journey that tree has been on to get to you in your living room! 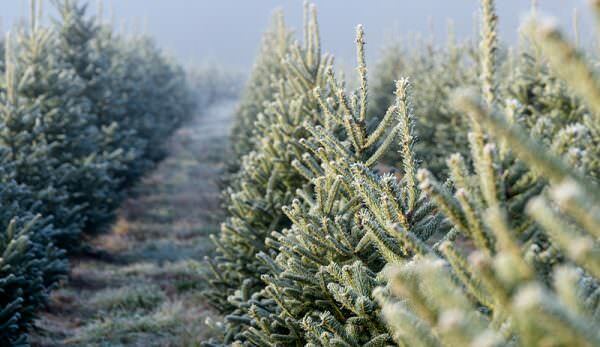 Most of the Christmas trees sold in the UK are grown on UK soil. There are many wholesale Christmas tree farmers in the UK and most of their produce goes to garden centres and supermarkets in the country. UK Christmas tree sales accumulate to £280m on average and three-quarters of these are homegrown. 80% of the market opts for the Nordmann fir tree; with soft foliage and glossy green needles, it’s a perfect tree for decorating. But before you hang tinsel and baubles off its branches, where did it all begin? The first step is to take seeds from cones that have come from mature trees and plant them in a nutrient-rich, mulch boosted bed. A protective sheet is placed over the top to prevent any damage from frost or sunlight. For the first two years of their life, weed control is essential to eliminate any competition for moisture, nutrients or sunlight. The seedlings are removed after three years and placed in plant beds until their roots are strong enough to hold them in a field. Christmas tree farmers can have hundreds of trees in one field and must look after them all. To keep the trees suitable for consumer demand, the trees are carefully tended to over the next seven to eight years. This is done by trimming the sides of the tree regularly to maintain the classic Christmas tree look; it can be cut in different ways to grow into a ‘full’ or ‘open’ tree. Bud-rubbing is another practice that farmers must do which is where the buds are removed from the top row of branches to enable the side branches to further develop – this results in a thicker tree. The trees are colour coded with ribbons depending on size and price bracket. In total, it takes around 12-15 years from seed to harvest! Though a lot of work goes into growing real trees, many people still prefer to go for an artificial tree. Looking at average monthly searches in Google over the past year, it appears that more people search for artificial Christmas trees (14,800) than real Christmas trees (9,900). However, this could be due to the purchase process of each (some fake trees can be bought online). Real trees come in a wide range of shapes and sizes. One advantage of grown trees is that, unlike artificial trees, you can choose a tree suitable for your own home and know that no one else will have one the same. In terms of cost, depending on the size, it is likely that you’ll pay more for a real tree than you would on an artificial one. Moreover, an artificial tree will last you around 10 years whereas a real tree will only last a few weeks. There is often talk about how buying a real Christmas tree is harmful to the environment. However, these trees are a crop and it is not dangerous to cut them down. Unlike artificial trees, real trees are biodegradable too – reducing their carbon footprint further. Of course, you could always grow your own Christmas tree as a profitable investment!